Building a successful salon customer database and community. New customers are attracted to the salon by the services offered on the salon's own website. Intersalon salons typically see an increase of 25% in new customers through online registrations alone. All Intersalon salon websites are optimised for search engines to ensure that the salon website is well represented in search results. Through the salon's website customers are encouraged to manage their account. They can view the check the status of their appointments, view the progress of any order placed and ensure that their profile is kept up to date. so saving the salon the job. 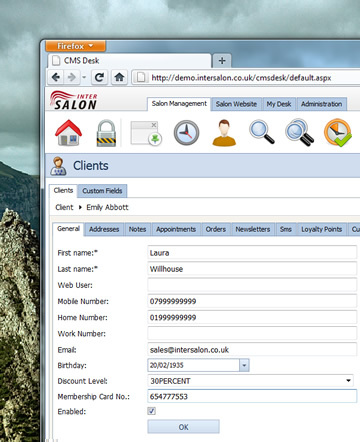 Each salon has the option to add their own custom data for each customer. This allows Intersalon to be customised to meet the specific requirements for the business. Once the custom fields have been created then they automatically appear throughout Intersalon so can used, for example when sending newsletters or SMS text messages. Intersalon has all the tools a salon requires to effectively manage and effectively promote the salon to their customers. A single step customer creation wizard with post code driven address look up makes it fast and easy to add new customers from within the salon. Customer service and technical notes are simple to add and then view. The customer discount levels and discount vouchers allows the salon to rewarding loyal customers. Discounts apply both within salon or when customers are purchasing services or products through the salon's own website.